Introduction: Tubular esophageal duplications are a challenging anomaly traditionally treated with resection via thoracotomy or thoracoscopy. An endoscopic approach to the esophagus with division of the common wall between the two lumens is an attractive and less invasive alternative to resection. We present our technique for endolumenal division of a tubular esophageal duplication. Case Presentation and Methods: A 17 year old male presented with acute chest pain and imaging studies revealed what appeared to be extralumenal air and contrast parallel the esophagus. Endoscopy demonstrated an esophageal opening 18 cm from the teeth and a CT scan confirmed the diagnosis of a tubular esophageal duplication extending from the level of the carina to the gastroesophageal junction. Endoscopic ultrasound was employed to visualize the thickness of the esophageal walls but resulted in flattening of the duplication as did not provide additional information over the CT scan imaging. An attempt at rigid esophagoscopy with division of the common wall using sealing devices was abandoned as the air insufflation via the flexible scope permits markedly superior visualization of the structures. A wire directed into the secondary esophagus was used to guide endoscopic needle cautery in the division of the mucosal and muscular wall between the two lumens. Results: A post procedure esophagram showed a single esophageal lumen with no evidence of contrast extravasation. The patient was discharged after 24 hours of observation having required no pain medication. There has been no clinical evidence of esophageal dysmotility, dilation, or other complication. 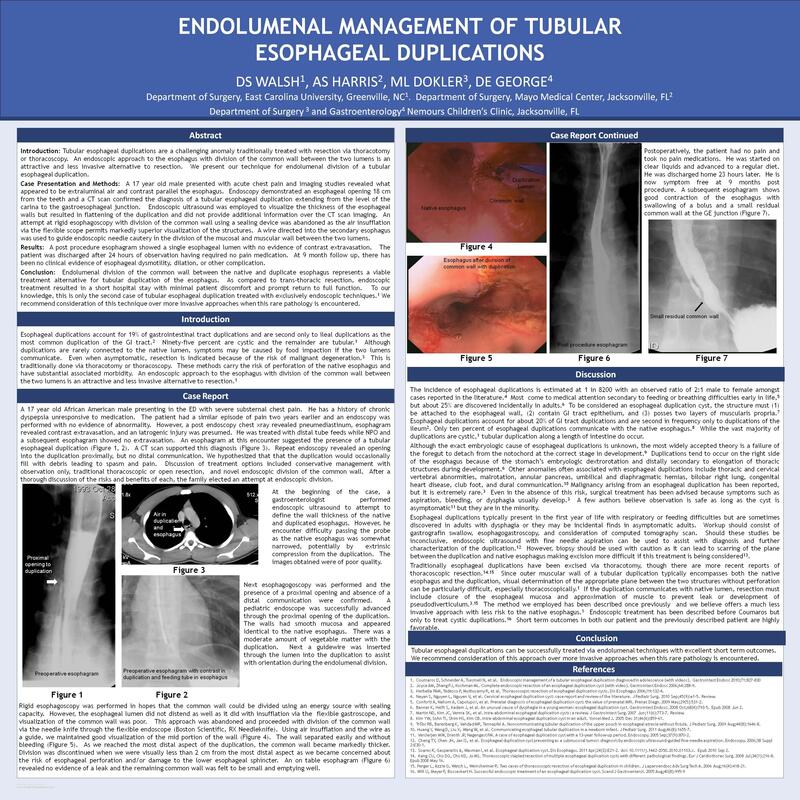 Conclusion: Endolumenal division of the common wall between the native and duplicate esophagus represents a viable treatment alternative for tubular duplication of the esophagus. As compared to trans-thoracic resection, endoscopic treatment resulted in a short hospital stay with minimal patient discomfort and prompt return to full function. To our knowledge, this is only the second case of tubular esophageal duplication treated with exclusively endoscopic techniques. We recommend consideration of this technique over more invasive approaches when this rare pathology is encountered.